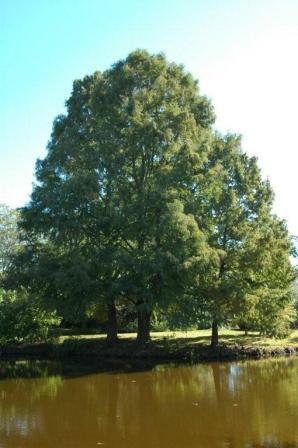 Botanical Name: Taxodium mucronatum (Tax-OH-dee-um mew-crow-NA-tum) Also known as Taxodium distichum var. Mexicanum. Habit: Large, graceful semi- evergreen to deciduous tree for full sun that sheds all its leaves as the new ones emerge in the spring. This bald cypress has no knees. Culture: Drought resistant but also tolerates wet soils along waterways. More tolerant of alkaline soil than bald cypresses in general. Foliage: Alternate, slightly softer than regular bald cypress. Flowers: Inconspicuous spring flowering. Male flowers are borne in long racemes. 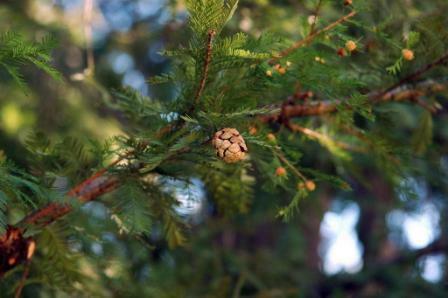 Fruit: Oval; round, female cones are 1-3 inches that are dry or hard. Range: Native from Guatemala to southern Texas. 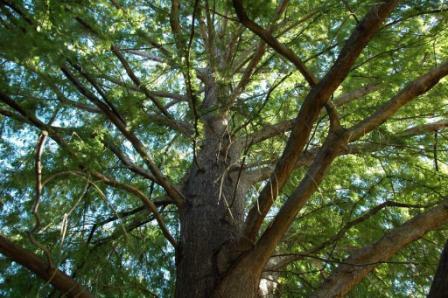 The main difference between Montezuma Cypress and Bald cypress is that Montezuma Bald cypress is more evergreen and the male flowers are borne in long racemes, whereas common bald cypress is deciduous and the male flowers are in short clusters. It is said that the extreme southern part of the state is the northernmost of its range and it has difficulty surviving winters farther north than San Antonio. However, there is one growing and doing very well in Plano Texas on the Frito National National Headquarters and many in Dallas and McKinney. Recommended zones: 7-10. It might even be hardy farther north. 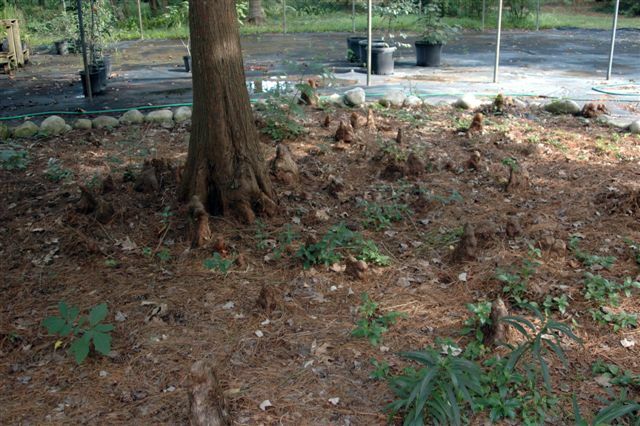 Propagation: Seeds and cuttings - see bald cypress. 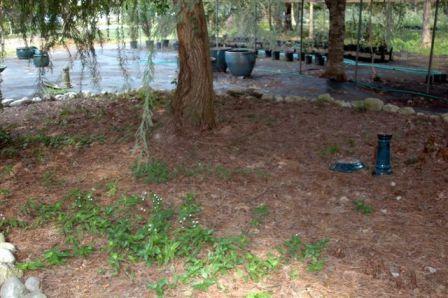 Uses: Shade tree or specimen in expansive areas. Problems: Very few if planted and maintained properly. Because of the nearly evergreen foliage, ice storm damage is sometimes an issue. Notes: The Tree of Tule (El Arbol del Tule), south of the city of Oaxaca, Mexico is one of the biggest and most spectacular trees in the world. It is over 140 feet tall, its trunk measuring more than 50 feet in diameter. 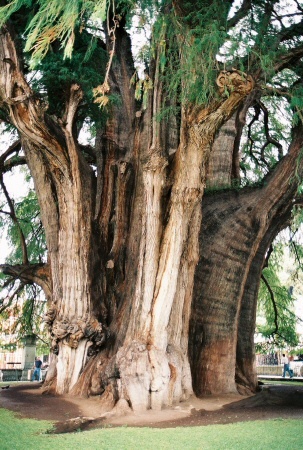 One of the cypresses in the group in front of the Frito-Lay Headquarters in Plano, Texas is a Montezuma cypress. It is almost evergreen and has significantly outgrown the other bald cypresses How it got mixed in with the other regular bald cypress trees is a mystery. But, I’m glad it’s there because it has shown that this tree is more cold tolerant than everyone thought. Since that time I have found many of these beautiful trees growing here in north Texas. It appears to be well suited for north Texas and similar climates and should be used more. How much farther north it will survive and do well is unknown at this time.